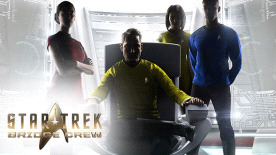 Star Trek™: Bridge Crew, playable in both VR and non-VR, will immerse you in the Star Trek universe. As officers of the Federation, every action and decision you make together will determine the fate of your ship and crew. TM & © 2017 CBS Studios Inc. © 2017 Paramount Pictures Corp. STAR TREK and related marks and logos are trademarks of CBS Studios Inc. All Rights Reserved. Game software © 2017 Ubisoft Entertainment. All Rights Reserved. Ubisoft and the Ubisoft logo are registered or unregistered trademarks of Ubisoft Entertainment in the US and/or other countries. “PlayStation” and the “PS” Family logo are registered trademarks of Sony Interactive Entertainment Inc.